As merger transactions become more complex, so do the remedies involved. 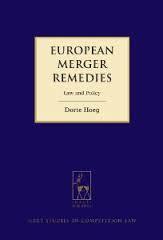 This book seeks to identify and examine the most important aspects of merger remedies, which have emerged and evolved in the European Commission’s policy and practice over the past 20 years. The in-depth analysis of applicable provisions and guidelines is structured in accordance with a typical ‘remedies lifecycle’: the negotiation, submission, assessment, adoption, implementation and enforcement of remedies. Furthermore, numerous conditional clearance decisions and judgments as well as studies and legal literature on the subject are described and put into a coherent analytical framework with the aim of providing as much nuance as possible in the evaluation of the Commission’s past and present remedies policy and practice. While the Commission indisputably has accomplished numerous successes in its remedies enforcement over the years, it has also encountered some significant obstacles and shortcomings along the way. To this effect, the final chapter in the book critically assesses whether the current framework, which has remained unchanged since 2008, continues to provide an adequate regulatory response to today’s remedies issues and challenges. Where adjustments and improvements are deemed desirable or necessary, possible measures are considered. Dorte Hoeg recently obtained her Doctor of Philosophy from King’s College London based on a thesis on EU merger remedies. She is a former national expert and case-handler at the European Commission’s Directorate-General for Competition and has also previously worked for the Danish Competition Authority, including representing the authority in the EU’s Advisory Committee on Concentrations. If you would like to place an order you can do so through the Hart Publishing website (link above). To receive the discount please type the reference ‘CCB’ in the voucher code field and click ‘apply’. « Exclusionary Effects in Google: Are They Relevant at All for the Outcome of the Case?